S Godley Transport Ltd has been in business for 18 years and have always worked exclusively for Tarmac. Both 32000Kg lorries are fully lived in the Tarmac signage and Goodley Transport Ltd is proud to work with Taramac. The company became a limited entity in 2015 after 15 years as a Sole Trader. S Godley Transport Ltd is a small and started with one vehicle and has increased its number to two lorries over the past 18 years, with four drivers, working opposing shifts on a 24 hour basis. The company is based in Radlett and has four full time drivers. All drivers have been trained to the highest standards by both Tarmac and FORS alike and undertake to do both FORS e-learning on a yearly basis and FORS Safe Urban Driving, classroom course every five years. 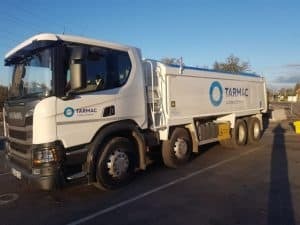 The company work exclusively for Tarmac and are engaged in taking away plainings on behalf of Tarmac as well as hauling aggregates on behalf of them during both the daytime and night and enjoy working on such contracts as TfL and CVU. The company were asked by Tarmac to do their FORS Bronze in 2016 as part of the commitment to Tarmac and the company soon saw the benefits of FORS which promote to achieve safer vehicles and drivers, alongside robust policies. 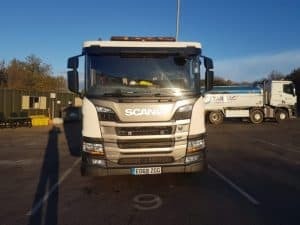 The benefits of joining the FORS became evident as its clearly promotes safety which is one of Tarmac’s underpinning rules for both driver and vehicle. The company saw that these were standards and ethos that they wished to adopt for improving the safety for both our vehicles and drivers. As Gold Members and take safety very seriously and this year we have brought vehicles which are at the Euro 6 standard as well as being N3 lower entry cabs. All our vehicles have full FORS safety, along with collision manager, lane deviation warning and overhead power cable detectors which makes for a safer driver and a more comfortable driver ride, thus making the driver a less stressed and safer driver. All drivers have undertaken FORS training, both classroom based and e-learning based, (E-learning every year and Safe Urban Driving every 5 years) and the company is proud to say that our accident rate remains at zero accidents for the fourth year running. We achieved our gold status in 2017 and this has meant that Tarmac see us as one of their premium partners within its extensive network of owner drivers. The company have a progressive policy towards alternative fuelled vehicles and before buying euro 6 vehicle also considered the use of an alternative fuelled vehicles, however currently there appears to be no viable alternative for the tipper market, within the costings and type of work carried out by Tarmac. However the company remains positive towards this approach, and hopes that soon the market will provide an alternative vehicle. The company have also assessed the use of alternative fuelled vehicles. As said earlier, all our vehicles are equipped to above the FORS required specs, and our adblue vehicles at Euro 6 standard, thus making for a more economical vehicle and a safer vehicle, with a better impact upon the environment. FORS has helped us benefit by us through their driver training programme, both classroom based and through e-Learning modules, and the regular toolbox talks prove to invaluable to our drivers in raising their awareness of both road safety and the environment. The company are progressive towards improving the environment, in that where possible, drivers are encouraged to take whenever possible public transport or car share. I believe this makes a difference to the environment, even thou we are a small company which has few meetings and drivers that work alternative shift patterns. “We take the environment very seriously.” – Stacey Godley, Director. All our vehicles are fitted with the latest 360 degree recordable cameras, near side proximity sensors and audible left turn alarms, Class IV,V, V1 Mirrors, Anti-collision manager, Lane Deviation, Overhead power cable detectors and flashing beacons on the cab of all vehicles, cyclist safety stickers to both the rear and sides of our vehicles. Both our vehicles are N3 chassis (Low entry Cabs). Although S Godley Transport Ltd is a small family company, we have continued to implemented a recruitment policy that outlines that we need to look at employing younger drivers/employees and provide training to that particular role. We have learnt that by equipping both our vehicles and all our drivers to the highest safety standards that our accident rate has remained at zero over the past four years and has saved both time and money in reduced claims to the company. Achieving Gold Accreditation will help us to continue to strive towards the highest road safety standards and that we are able to continue to maintain this safety record and protect the environment. This year we have seen an improvement on our fuel figures, this we believe is mainly due to our Euro 6 vehicles and a driver understanding of eco driving. The future plans of the company are to ensure we that our safety record continues to be to the highest standard, through driver training and fitment of vehicle safety equipment, while promoting the best use of vehicles so as to protect the environment in line with Tarmac policies. Maintaining our Gold accreditation will help to keep the company to maintain these goals and help to improve our industry’s safety standards, whilst looking towards reducing our emissions through less polluting vehicles.